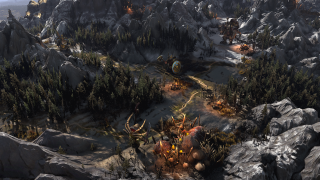 Today, Creative Assembly is unveiling Total War: Warhammer's campaign map. You can see the reveal video above, which details some of the new features and functions. PC Gamer recently had the opportunity to talk to Rich Aldridge, campaign designer for the upcoming fantasy strategy. Read on to learn about each races differences, how quests are integrated into the campaign, and how Boris Todbringer isn't a fan of diplomacy. PCG: How does the opening for each race play out? Rich Aldridge: Each race will have the same unique starting point—for example Reikland with the Empire, and the Badlands for the Orcs. It will start small, and will eventually allow you to seize territories and work with or against other neighbouring factions. You don't start as the entirety of that race. You're just one tribe of the Orcs, so you have the opportunity there to seize territories, form alliances and build slowly. Also, in doing so, you get the opportunity to learn the background of the characters as well. You get familiar with who they are, where they come from and what they're aspiring to do. Karl Franz of the Empire is trying to unite all the different Elector Counts together. Thorgrim Grudgebearer is trying to take back all of the Dwarf strongholds. Some of the quests will start to be drip-fed to you, and you can go off and enjoy those. You can also leave them as well. If you're a more experienced Total War fan and you want to go and do your own thing, you can set those aside and come back at a later date. Eventually, you'll encounter some minor races and the other, larger main races. PCG: Do you see the quests as a tutorial system, then? Rich: It's a good way to highlight certain features about the game, and provide epic rewards as well. It's our way to allow these legendary characters to develop over time—becoming the characters that the Warhammer fans know and love. Getting Ghal Maraz should be one of the epic conclusions for Karl Franz. PCG: Does the different terrain affect each battle? Rich: There are some elements of that. The Underway, for example. Although it's underground, it allows dwellers of caves to have buffs. Things like night goblins and certain dwarven units like miners. They'll get benefits for being underground in those situations. And then we'll have other areas of the map where maybe you'll be up in the Norscan climes. They're duly kitted out for that, whereas other guys are not going to be. They're going to suffer attrition penalties, which you've become accustomed to. PCG: The Greenskins are very war focused, is there a different challenge with the other races? Rich: They're very much like that, and they all have different victory conditions as well. It's not the same goal for all the races. Dwarfs are going to be about righting the wrongs in the Great Book of Grudges. They're looking to do different things to say the Empire, which is all about unifying all of man together and protecting themselves from the invasion of Chaos. Greenskins, again, they don't have to unify. They can go around smacking the hell out of all the different tribes. They're all about fighting, and saying I'm the 'ardest Orc. They're much simpler in that sense, and we've gone a long way to show you that with the simple building trees and things. Whereas, if you were to see the Dwarf ones, they're going to be far deeper and full of more civil-based stuff. So their campaigns will feel quite different from one another. PCG: Does diplomacy feature at all? Rich: It's there as a system that you've seen before. Everybody has the opportunity to broker a deal with somebody, but, we'll be honest, certain races don't like one another. If you were to have Vampires and men aligned to one another, you'll have to go a long way down the road to make something like that happen because they've got different goals. It's a possibility, but it would be one where you'd have to shower them with things that they require first. Likewise, you're going to have all of the backstabbing. The Empire's got a lot of that. Boris Todbringer in Middenland despises Karl Franz. He's not going to just lay down his sword and join the fight with him, so they're going to be backstabbing. You're not going to have it all your own way, where you're just steamrolling and acquiring all of those pieces. Al Bickham: Yeah, diplomacy, as Rich mentioned, is not just between races. It's within the factions. Rich: Oh yeah, with the Greenskins you might try and essentially form a confederation between the different tribes. Or you might just go, no, I'm hard as nails, and go crush and accumulate them into your forces anyway. You have the different opportunities there to do one or the other. PCG: With all the heroes and the magical items they equip, how do you manage the power curve and keep things challenging? Rich: So you can't get everything. You can get some things, so there's that replay factor there. Maybe you went down one path in one playthrough, and then you get to go back and experience something else. The magical items are random drops as well. You've got legendary items, which are given when you complete a quest, and then you've got random ones as well. They're weighted depending on what difficulty level you're playing on as to what you're going to get. And you can share those out among your characters. In terms of difficulty, you can lose those things as well. People can steal them from you. You've got to be careful—it's not just walk into a battle, "oh, that didn't work out," and go back again and again. Sometimes you're going to lose those things and you might not be able to get them back in the case of the generic items. Legendary items are yours to keep, but you might suffer a penalty if you've taken Grimgor into battle and he's been slain. There are times in which you'll be put back into check.